Since their announcement in 2013 during Chinese President Xi Jinping’s visit to Kazakhstan and Indonesia, the New Silk Road Economic Belt and 21st Century Maritime Silk Road (termed together the “One Belt One Road” initiative) have been extensively discussed among China’s academia and policymaking circles. Chinese Foreign Minister Wang Yi, at a press conference accompanying China’s recent parliamentary session, called the initiative a “central focus” of China’s foreign policy in the year 2015. As a key part of the narrative of the new Chinese leadership, the One Belt One Road (OBOR) initiative has not only become one of the top priorities of the Chinese government, it has also attracted considerable interest from abroad, and particularly from neighboring Asian countries. A case in point is that more than 30 countries have joined the Asian Infrastructure Investment Bank (AIIB). Despite the seriousness with which Asian countries are taking the initiative and its tremendous potential impact on the Eurasian continent, Europe has to date been slow and reluctant in responding. Although some reports can be found in the media, there is little serious research in European academia on the OBOR initiative, nor any real discussion at the official level. The subject has been missing from the official EU-China dialogue. This might be explained by Europe’s relatively long distance from China, as well as by the immaturity of the initiative, which will need a long time to take shape. But there is also the possibility that the EU may have underestimated the significance of this emerging Chinese project, and in doing so could be losing an opportunity to benefit from win-win cooperation. Although the OBOR concept needs to be fleshed out and specific tools need to be developed, its implications for the EU are hardly negligible. Based on the EU-China 2020 Strategic Agenda for Cooperation, there are stakes for the EU in at least three areas: trade and investment, peace and security, and people-to-people exchange. Trade and commerce have been at the core of EU-China relationship. The EU has been China’s largest trading partner since 2004, and China is the EU’s second largest trading partner. Two-way trade reached $615.1 billion in 2014. This trade interdependence should be a major incentive for the EU to pay close attention to and engage in the OBOR project. As trade is highly reliant on transport infrastructure, the BOBR project is sure to have implications for EU-China trade. For centuries, the long distance between Europe and China has been a natural obstacle to strengthening bilateral trade relations. As the OBOR project concentrates on enhancing connectivity and transport infrastructure, there is huge potential to enlarge and accelerate the movements of goods between China and Europe. This is evidenced by the existing Trans-Eurasia railroad that connects the City of Chongqing in southwestern China to the German city of Duisburg. According to a CNN report, this rail route takes only 16 days, making it much faster than the lengthier shipping routes. Since its opening in 2011, China has transported $2.5 billion worth of goods to Europe via this route. China, of course, is not the only beneficiary from this improved connectivity. It is estimated that using this rail line, the delivery of a European car to China could be reduced to 25 days, comparing to two months by sea, thus reducing the time cost of shipping. Similar trading benefits could also extend to the countries along the line. In addition to the potential benefits of the accelerated movement of goods, Europe could also benefit from participating in the OBOR initiative itself. Although the OBOR is a Chinese initiative, China will not be able to do it all alone, but will require international contributions and cooperation. In this regard, EU countries have an important role to play as well as much to gain. According to international strategist Farzam Kamalabadi, Europe could cooperate with China in this sweeping initiative by taking advantage of its advanced technology, capital, and management experience. 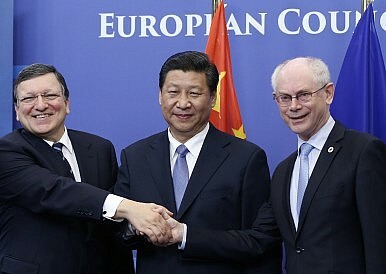 The decision of several EU countries (U.K., Germany, France, and Italy) to join the AIIB may be a step in this direction. European countries would also benefit from Chinese investment in the OBOR project, which is expected to reach $1.6 trillion. As China has huge capacity in manufacturing and infrastructure building backed by abundant foreign reserves, there is also an opportunity for Europe to update and reinforce its own infrastructure, something that would be conducive to its economic recovery and growth in the long run. A recent example is that during the 2nd China-Central and Eastern Europe summit in 2013, Chinese Premier Li Keqiang announced plans to jointly build a railway between Serbia and Hungary. Development and security are closely linked, and the OBOR Initiative has positive implications for peace and security, in addition to the potential to reinforce economic exchange and intensify trade relations between the EU and China. On its way to Europe, the OBOR initiative encompasses some of the most unstable countries and regions in the world, including Central Asia and the Middle East, areas that constitute the EU’s “extended neighborhood” and have significance for European security. One of the EU’s foreign policy objectives is to further engage China in the international community and encourage China to become a responsible stakeholder. Meanwhile, in responding to the criticism that China has been “free-rider” in international society, the Chinese President Xi Jinping made it clear that China is willing to share development opportunities. Since China is determined to carry out the OBOR project, it also means that China is willing to align itself with the destiny of other countries, as the OBOR aspires to forge a “community of shared interests, destiny and responsibility.” The OBOR initiative could thus serve as an opportunity for the EU to deepen cooperation with China in terms of both development and security. As the OBOR project unfolds, it is likely to encounter multifarious security challenges, requiring China to cooperate with Europe to protect its own interests. The current crises in the Middle East and Ukraine are cases in point. The Iran nuclear crisis and continuing conflict in Ukraine raise questions about the feasibility of China’s OBOR initiative, but this common challenge could provide an opportunity for the EU and China to bolster their security cooperation. People-to-people exchange is the third pillar of EU-China relations, and the weakest. In 2012, the EU and China established the High Level People-to-People Dialogue as an overarching mechanism to promote trust and intercultural understanding between the two sides, but this mechanism remains quite amorphous due to the lack of specific action. As such, the OBOR initiative is timely, since it promises to add substance to the people-to-people exchange mechanism. Historically, the concept of the “Silk Road” was not only about trade links, but also had significant cultural meaning. It served as a passage for the exchange of Eastern and Western civilizations, bringing European music, dance, painting, architecture, and medical science to China while introducing Chinese silk, tea, porcelain, printing arts, and Confucian ideas to Europe. These exchanges left deep imprints on the development of both societies and civilizations. In the same vein, the OBOR initiative could serve as a cultural bridge between Europe and China, which should not only be understood as “two markets” and “two forces,” but also as “two civilizations.” For now, discussions on OBOR mostly focus on trade and security concerns, with Europeans emphasizing the commercial interests while the U.S. worries more about the potential geopolitical implications. But for global civilization, the significance of the OBOR goes far beyond the narrow commercial interests and security concerns. As the OBOR cuts across the world’s major civilizations, it is expected to bring new opportunity and possibility for global integration. As a new narrative, the OBOR still needs time before it is fully formed. Execution will take even longer, given the sheer size of the project and the unpredictable political-security risks that lie ahead. Still, the EU should not underestimate China’s determination to carry forward the project and its implications for the EU. As we’ve seen, the OBOR initiative has significant implications for the EU and for EU-China relations in terms of trade, security, and people-to-people exchange. In this sense, the EU and its member states are not outsiders but stakeholders in the initiative. In fact, the impact of the OBOR project could be felt by the EU to at least some extent with the launching of the “16+1” cooperation framework in 2012. Within this framework, China has been cooperating with Central and Eastern European countries on infrastructure building. As China invites more European countries to participate in the project, the EU will be under pressure to coordinate a European response at some point. The time has come for the EU to think about how to tap the opportunity of the OBOR initiative to reshape EU-China relations. Shaohua Yan is a PhD candidate of European Studies at the University of Hong Kong. His academic interests cover EU-China Relations, Chinese and European foreign policy, and regional integration. He writes regularly for major Hong Kong newspapers, including Hong Kong Commercial Daily, Taikungpao and Apple Daily.